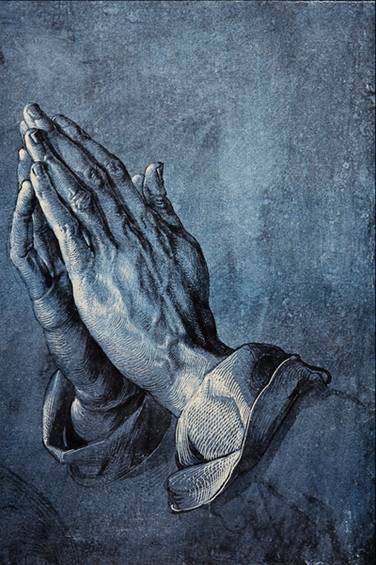 If you are interested in a short reflection on Albrecht Durer’s Praying Hands (and plenty of others) to sustain you through your week, visit the excellent ArtWay site, where you can also sign up for weekly email reflections. I get them and find them a helpful oasis of visual worship to interrupt my very wordy life. I have been thinking about the whole “Stepping out the boat” thing and what has churning around in my head is the “love thy neighbour” command. I guess it is pretty important because Jesus said Love the Lord your God with all your heart and with all your soul and with all your mind.’ and then Love your neighbour as yourself. He said this was lke the first command. I don’t know about you but this is hard stuff. Often I think love my neighbour … if. If they are like me, if they friendly, if they are the kind of people I want to hang out with. We have people accross the road from us that seem to come and go all the time and I am never really sure who lives there. Sometimes I am thinking what really is going on accross the road? Perhaps they just need help I am not really make the effort to find out. Of course our “neighbours” are not limited to the people over the fence but almost anyone we come in contact with. It ties in well with the Alongsiders concept we looked at last year. Perhaps If I pactice the first command Jesus gave ” love the Lord you God .. etc then perhaps loving my neighbour may come easyer. Not always easy when you are faced with screaming kids (must be our house), yapping dogs, boy racers and wild parties but instead of putting up mental fences to block them out of our lives we could put our Jesus eyes on. This whole stepping out of the boat thing is a bit daunting esp if a “storm” suddenly whips up but perhaps leaning over the fence and saying hi and how are to your neighbour could be a start.